Lesotho, (le-soo-too) is known as Southern Africa's kingdom in the sky. A stunningly beautiful, mountainous country known for its abundant summer rainfall, vast reserves of water and thick mountain mists. 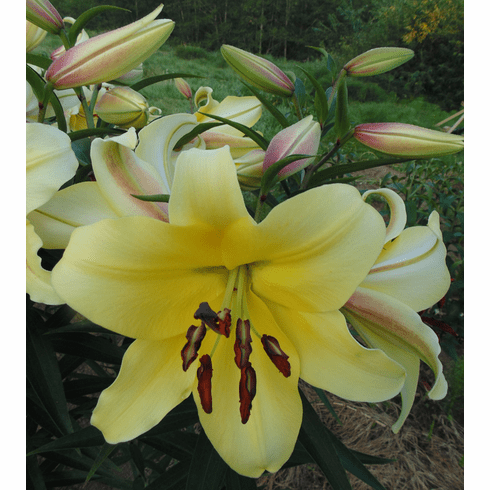 This Orienpet hybrid lily bulb produces big, fat buds that burst open to reveal large, solid lemon yellow, fragrant flowers with green reverse and raised papillae. 'Lesotho is nice as background or accent because of its height. In answer to all the questions about our photo last year, yes, that is really fog in the background which is typical of our NW weather in July and August. 3 to 4+ Feet. Late July / Early August Flowering. Bulb Size - Our standard for bulbs of this lily cultivar ranges from Premium-size (16/18 cm) to Exhibition-size (over 20 cm).